This undated image made available in the Islamic State's English-language magazine Dabiq, Wednesday, Nov. 18, 2015, claims to show the bomb that was used to blow up a Metrojet passenger plane bound for St. Petersburg, Russia, that crashed in Hassana, north Sinai, Egypt, killing all 224 people on board. The Islamic State group has released a photo of what it claims is the bomb that took down a Russian jetliner over Egypt's Sinai Peninsula last month and says it targeted the plane because of Moscow's aerial bombardment in Syria. The photo, appearing on the extremist group's official online English-language magazine Dabiq, shows a yellow can of Schweppes Gold soda that it said contained the improvised bomb that Russian and Western investigators have concluded brought down the Metrojet Airbus, killing all 224 people aboard. Islamic State had previously claimed responsibility for the attack, an assertion that was confirmed Wednesday by the White House. A White House spokesperson said that even though the Egyptian investigation had not been concluded, "we assess it is likely that this was an ISIL terrorist attack." The spokesperson said that enhanced security measures would continue and that the U.S. would work closely with partners to find the perpetrators of the attack and "bring them to justice." 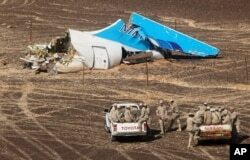 Egyptian Military in cars approach a plane's tail at the wreckage of a passenger jet bound for St. Petersburg in Russia that crashed in Hassana, Egypt, on Nov. 1, 2015. The Islamic State magazine claimed jihadists had initially planned to down a plane belonging to the U.S.-led coalition conducting an air campaign against Islamic State fighters in Iraq and Syria. But Dabiq said the Russian passenger jet was targeted after Moscow began its own air attack in September against Syrian rebel groups fighting forces loyal to Syrian President Bashar al-Assad. "A bomb was smuggled onto the airplane, leading to the deaths of 219 Russians and 5 other crusaders only a month after Russia's thoughtless decision," the magazine said. Dabiq also showed what appeared to be a detonator and a switch on a blue background and a photo of what it said were passports of Russians killed in the October 31 disaster that were recovered from the wreckage in the Sinai desert. The Islamic State said it had discovered a "way to compromise the security" at Egypt's Sharm el-Sheikh airport to plant the bomb. The Russian newspaper Kommersant said authorities concluded the bomb was in the rear of the aircraft's main cabin, near the tail section, not in the cargo hold as experts had first thought. 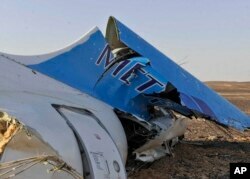 The tail of a Metrojet plane that crashed in Hassana, Egypt on Saturday, Oct. 31, 2015. Meanwhile, Russian President Vladimir Putin and his Egyptian counterpart, Abdel Fattah el-Sissi, agreed Wednesday on new but undisclosed airline security measures as the first step toward resumption of flights between the two countries. The two leaders spoke by phone a day after Moscow concluded that a bomb had brought down the jetliner shortly after it took off from the Sharm el-Sheikh resort bound for St. Petersburg. Egypt said Sissi told Putin he understood the Russian people's pain over the disaster, but made no mention of a bombing. Egypt, worried about the air disaster's effect on its key tourism industry, has declined to say a bomb caused the crash and says an international investigation is still underway. Within hours after Moscow concluded that terrorists took down the jetliner, Putin launched massive strikes Tuesday on Raqqa, the Islamic State's self-proclaimed capital in northern Syria.